California residents warning: Cancer and reproductive harm- See www.P65Warnings.ca.gov for more information. Comprehensive Standard Series HDMI cables with Ethernet feature 28 AWG high resolution, low loss construction are pefect for those on a budget! Standard Series HDMI cables support the latest in HDMI technology including high speeds of up to 10.2 Gbps, Deep Color, 120 Hz refresh rate, and Dolby TrueHD and DTS-HD Master audio. Our HDMI cables also have bi-directional Etherenet capability, an audio return channel, are 3-D capable and support up to 4K resolution. Molded gold plated connectors and double shielding provide superior connectivity and rejection of EM and RF interference. Comprehensive's extra flexible jacket and molded strain relief provides unsurpassed durability. Fully HDCP and RoHS compliant. Our Standard Series HDMI High Speed cables come with ATC Certification and our Lifetime Warranty for a lifetime of worry-free performance. 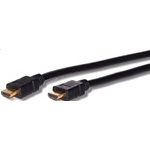 We have no downloads available for the Comprehensive Video Standard Series HDMI with Ethernet Cable, 6 FT at this time. Get free shipping on all cables!